It’s not uncommon for people to have physical reactions to certain foods. But is your reaction an allergy or food intolerance? It’s easy to confuse the two because food intolerance can sometimes cause symptoms suspiciously similar to a food allergy. To make things even more perplexing, some foods can cause both. A true food allergy creates an immune system response, causing a variety of symptoms that can affect several of the body’s organs. For some people, allergic reactions to particular foods (peanuts, milk, shellfish, etc.) can be severe and even life-threatening and precipitate anaphylactic shock. Because severe food allergies can be fatal, obtaining medical advice is crucial. Food intolerance produces less serious effects on the body and these are often limited to digestive issues. It’s basically a chemical reaction. In some cases, food intolerance may still allow you to consume the offending food – you just have to be careful about the amounts. Food intolerance is still poorly understood (and even doctors can get it wrong), but some of the known causes include irritable bowel syndrome, bacterial toxins (food poisoning), psychological factors including recurring stress, or sensitivity to specific food additives or preservatives. In some instances, the body may lack a particular enzyme that’s necessary to fully digest a certain food (as in the case of lactose intolerance). Ask any restaurant owner and they’ll tell you there are a lot more people asking for gluten-free meals these days. You’ll also spot more products on supermarket shelves that proudly proclaim their gluten-free status. This is a genetic auto-immune disorder that triggers damage to the small intestine if gluten is consumed. It causes a variety of symptoms including dental caries, bloating, abdominal pain, diarrhoea, iron deficiency, bone loss, liver dysfunction, joint pain, weight loss, malnutrition, skin issues, neurological disorders and fatigue. Coeliac disease affects about one in 133 people, but it’s estimated over 80 per cent of those with the disease remain undiagnosed. Treatment involves strict adherence to a gluten-free lifestyle. This is a true allergy that causes an immune response to one or more proteins found in wheat (which can include gluten). Symptoms include nausea, vomiting, diarrhoea, bloating, irritation of the throat, mouth or eyes, breathing difficulties, nasal congestion, hives and a rash. As with many other food allergies, symptoms can take hold within a matter of minutes. Treatment for this allergy involves strict adherence to a completely wheat-free diet. While NCGS shares some of the symptoms of coeliac disease, it has no genetic component and is not an auto-immune disorder. Unlike coeliac disease, it doesn’t damage the small intestine and there’s no diagnostic test for it. It’s a condition that has raised more questions than answers – currently, there’s not even agreement on whether it’s caused by gluten or some other chemical component found in wheat. Symptoms include abdominal pain, diarrhoea, bloating, mental and/or physical fatigue, neurological disorders and joint pain. NCGS is treated by adhering to a wheat/gluten-free diet to some degree. For the one to two per cent of the population that suffers from coeliac disease or wheat allergy, avoidance of wheat or gluten is crucial. But what about the rest of us? A CSIRO survey of 1200 Australians revealed that around one in 10 were actively limiting their eating of wheat-based products, with women more likely to avoid wheat than men. While 1.1 per cent of Aussies reported that their reason for wheat/gluten avoidance was due to a diagnosis of coeliac disease either in themselves or a family member, the vast majority of respondents said they were going gluten-free because they believed it would assist them in dealing with symptoms they attributed to the consumption of wheat. These were mainly gastrointestinal issues like bloating and abdominal pain. What’s interesting about this study is that when asked if they had obtained a formal medical diagnosis that singled out coeliac disease, food intolerance or wheat allergy as the cause of their problems, 84 per cent said ‘no’. What this means is that a lot of people are simply assuming they have gluten intolerance without any medical confirmation. The popularity of the Paleo diet and similar regimens that advocate giving up grains has no doubt fuelled this gluten-free trend; the profusion of high-profile celebrity endorsements of gluten-free habits has likely contributed as well. However, according to the Australian Dietary Guidelines, grains form an important part of a healthy diet, providing valuable protein, vitamins, minerals, fibre and calcium. Don’t cut important foods out of your diet without seeking medical advice first – you could be missing out on important nutrients. For those who are adopting a gluten-free lifestyle in an attempt to lose weight, this can be a problem because when gluten is removed from food, fat or extra sugar may sometimes be substituted for it. Gluten/wheat-related health issues that are not a result of wheat allergy or coeliac disease are still a bit of a grey area, but one thing is uncertain – if you’re going to go gluten-free, do so as a result of a doctor’s diagnosis, not the opinions of your foodie friends or some ultra-skinny Hollywood celebrity. In this country, around 10 per cent of infants, five per cent of children up to five years old and two per cent of adults suffer from some form of food allergy. Around the world, allergies in general are increasingly common, especially peanut allergy in pre-schoolers. About 60 per cent of allergies make an appearance in the first year of life, with cow’s milk being one of the most prevalent. Most children, though, will grow out of this allergy before they start school. Children who are part of a family where another family member has an allergic disease (like asthma or eczema) are 20 to 40 per cent more likely to develop an allergy themselves. When two or more of their family members have allergic diseases, the risk jumps to 50 to 80 per cent. Food allergies can affect many different parts of the body. Eyes may water or get itchy. There might be sneezing or nasal congestion. Your mouth can puff up or itch and your throat can swell. You might experience a skin rash, headache, fatigue, irritability and even convulsions. Breathing problems can include wheezing, coughing or asthma. Vomiting, diarrhoea and stomach cramps are also common symptoms. Allergic reactions to food are not evenly distributed among the food groups. In fact, around 90 per cent of all allergic food reactions are caused by only a handful of foods. The main offenders are peanuts, fish, milk, eggs, sesame, tree nuts, soy, shellfish and wheat. 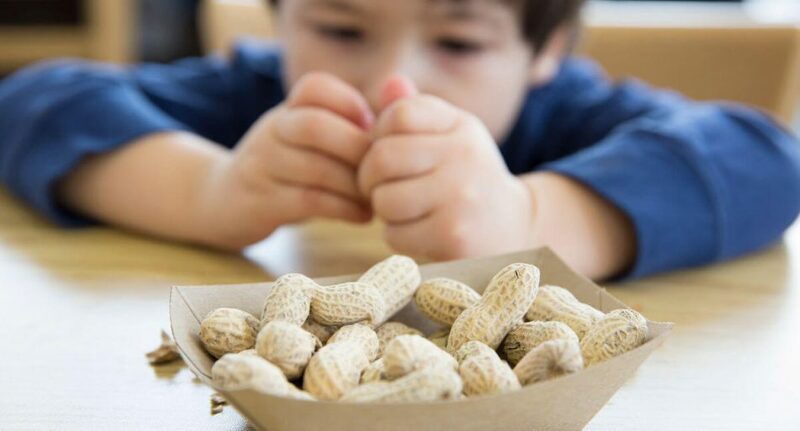 In older youngsters, peanuts are one of the more common allergies because only about a quarter of young children outgrow it. If you or a member of your family has a reaction to a particular food, it’s not always easy to work out if the cause is an allergy or food intolerance. While food intolerance symptoms can come on fairly quickly, they can also take up to 24 hours to develop – and the quantity of specific food consumed is usually a factor. You might be fine eating a small amount of something, and only when you’ve passed a quantity threshold would you start to have problems. With food allergies, symptoms usually manifest themselves rapidly – often within a few minutes. Therefore, the quicker symptoms develop and the more obvious they appear to be, the more likely they’re caused by a food allergy. And if only a small amount of the food is consumed but a severe reaction occurs, it’s almost certainly caused by an allergen. It’s easy to determine which food is causing an allergic reaction when symptoms are almost immediate. When it’s not so straightforward to pinpoint the offending food, you can often narrow down the possibilities by keeping a diary of foods and symptoms to see if any patterns become obvious. Another plan is to remove suspected foods from your diet for a fortnight and then reintroduce them individually to test your body’s reactions (this should only be done under medical supervision and never in the case of anaphylaxis). When in doubt, consult your doctor – they can perform additional tests to help identify the culprit, including blood tests for common allergens and skin-prick tests using various food extracts. The deadly side of food allergies is that in some cases they can cause a severe allergic reaction called anaphylaxis (the same reaction that affects some people stung by bees or ants). Anaphylactic shock can come on within minutes of consuming a particular food and its symptoms can be life-threatening. These include a swollen tongue, difficulty breathing or talking, tightness/swelling in the throat, persistent coughing or wheezing and possible dizziness and collapse. Younger children can become ‘floppy’ and pale. With anaphylaxis, time is of the essence and an injection of adrenaline is necessary to prevent severe injury or death. Those with a known risk of anaphylaxis are often medically prescribed a single, fixed dose of adrenaline in the form of an auto-injector (such as EpiPen®), which they carry with them in case of an emergency. These are designed to be jabbed into the outer muscle of the mid-thigh. Anaphylaxis constitutes an emergency, so seek immediate medical assistance if it occurs. In Australia, research continues on ways to prevent food allergies in children. What’s known at present is that exclusive breastfeeding during the first four to six months of life appears to protect against early childhood development of allergies. There is, however, no concrete evidence to suggest that avoiding potential allergens during pregnancy prevents children from developing allergies. Using a soy-based milk formula, for example, has not been shown to make a difference one way or the other. However, starting on solid foods early and being exposed to second-hand cigarette smoke have both been identified as risk factors that may increase a child’s chance of developing allergies early in life. In Australia, food labels are required to list certain types of foods and additives that may cause allergic reactions. These include ingredients like milk products, fish products, egg products, crustaceans and their products, peanuts and their products, sesame seeds and much more. Always check labels carefully when buying food. Even if the offending item is merely a processing aid rather than a major ingredient, it can still cause problems – and must still be declared on labels. Some of the more common causes of food intolerance include dairy products (milk, yoghurt, cheese, etc. ), eggs, chocolate, red wine, strawberries, food additives such as MSG, tomatoes and citrus fruits. Note that some of these are also common food-allergy culprits. If you have any questions about food allergies or food intolerance, three of the best places to find reliable answers are (a) your doctor, (b) Nutrition Australia and (c) the Dieticians Association of Australia. Food allergies and food intolerances can be unpleasant, inconvenient and occasionally dangerous, but are normally manageable if you seek medical help. When in doubt, see your doctor – the sooner the better!